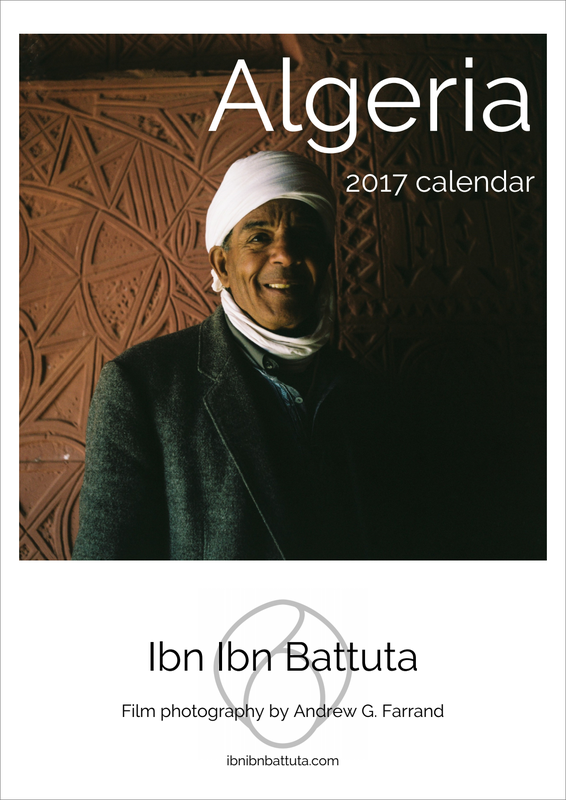 Ibn Ibn Battuta’s “ALGERIA 2017” wall calendars are now on sale! Just like last year, the calendars feature 12 high-quality photos shot on film with my Rolleicord during my travels across Algeria. It includes a wide diversity of regions and shows a mix of Algeria's natural and man-made beauty and daily life scenes. Buy today to bring some color to your home or office, or to share an Algeria-themed end-of-year gift with friends and family! Supplies are limited, so pick yours up soon at one of these fine establishments. If you are interested in place a large order, please contact me directly at ibnibnbattuta@gmail.com. As always, thank you for your interest and your support. I'm buying one as soon as I get my next paycheck. Nice work man! Very nice. I have bought several as presents, in spite of the person at the bookshop warning me that they were "excessivement chers" when I called to inquire. @GBDZ Hmm, I'm sorry to hear that! But very grateful for your support despite this peculiar salesmanship. Many thanks!